The October 2018 Horizons is now online at http://horizonsmagazine.com/mags_online/10-18-Issue.pdf . The flipbook version is at http://horizonsmagazine.com/fb/10-18/index.html. We are honored to have nationally known Maya White doing the monthly horoscopes. Maya White is a Master Destination Astrologer and one of only 90 people in the world certified in Astro*Carto*Graphy, a specialized branch of astrology which helps people find their perfect place on earth for love, prosperity, and personal growth. 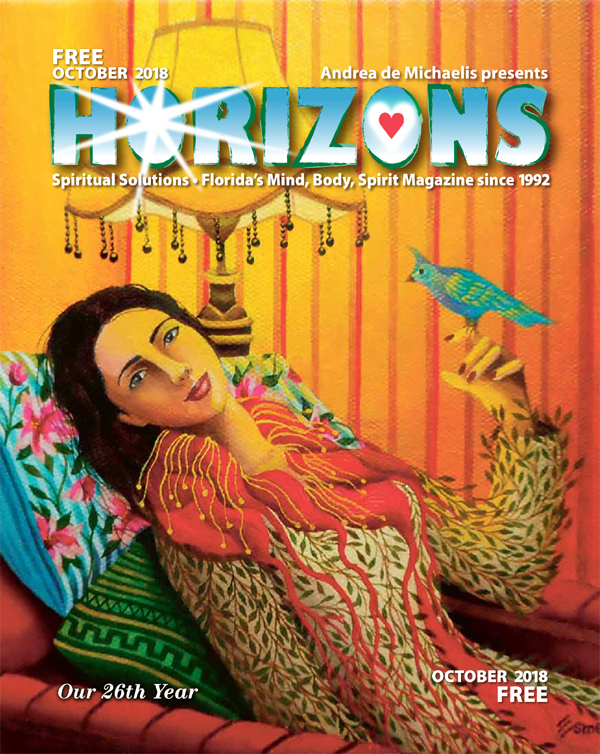 Visit Maya’s website and for an introduction to Maya White, see http://horizonsmagazine.com/blog/introducing-horizons-new-astrologer-maya-white/ Contact her and ask what she might do for you. Here are this month’s horoscopes: Cusp dates are accurate for 2018. Sometimes the actual date the sun enters the sign varies by a day or so because of a leap year, or, even the time of day. I assure you these cusp dates are correct for 2018. Aries – (March 20 – April 18) Now that Mars has gotten his act straightened out, your energy flows much more evenly. It’s time to pick up where you left off before Mars stationed retrograde. This month is smooth sailing for you. Stand firm when a power struggle comes up on or around October 12th – you may have to give into your partner’s demands, but you can do it in a way that leaves you a winner. Taurus – (April 19 – May 19) Venus goes retrograde October 5th, and this will definitely impact you even into next month. Get comfortable with working behind the scenes, have patience because Mercury goes retrograde on the same day (Nov 16) that Venus stations direct!! Get a deck of cards and learn to read them well. Venus delivers people with situations from your past who want your time, money, and energy. Gemini – (May 20 – June 20) Unexpected benefits arrive by the end of the month. The gains come through personal and professional partnerships, so it pays you to get out a bit and socialize. Mercury, your ruling planet is very busy, and this will make the month fly by. If you have any critical tasks related to bookkeeping, billing, or even web site maintenance – do it NOW before Mercury retrograde next month disrupts your communication network. Cancer – (June 21 – July 21) It likely feels like a long haul for you. All year the Moon’s karmic north node has been winding through Leo, and late next month it enters your sign. Think of this as the wheel of fate, or the hands of time. That one thing you’ve been waiting for is slowly moving into position. Enjoy this month as a special time. October is for balance and understanding. Make a special day to love your Mother on the 26th when Venus dances between the Sun and the Earth. Leo – (July 22 – August 22) You have stunned so many as you continue to live life on your own terms. The family has a way of overwhelming your energies, but this time you’ve maintained. It’s time to hold on to your sovereignty, Leo. Venus retrograde after October 6th tries to wind you back into commitments at home; and you may even succumb for a short time. But, you’ve changed; and now you are free. Virgo – (August 23 – September 21) The secret ace for your sign this month is Pallas Athena, the goddess of peace and wisdom. Pallas is also a grand mentor in taking care of practical matters; she teaches us how to take excellent care of ourselves. Let her speak to you about health. You can make great strides now, but only with your well-being intact. The colors blue, purple, and the stone Lapis Lazuli are associated with Pallas Athena; invite these into your life, and be healed. Libra – (September 22 – October 22) Put on your Libran air element thinking cap now because Venus retrograde will deliver some surprises. Karma need not be a negative thing; it can be good, too. But, karma is the word to frame this month. You want to be very clear in evaluating both people and events. Some people try to influence you through guilt, others through flattery. Your mission is to be true to yourself. Scorpio – (October 23 – November 21) Think of Venus retrograde in your sign as a chance for a second harvest. A gleaner is someone who goes back and collects assets (food, money) that have been previously overlooked. This is not to say that you cannot move forward successfully, but there is a caution to move slowly and minimize risk. Stick to what you know, do not loan or borrow money, and keep a tight rein on spending. And, relationships; wait and see is the way to go. Sagittarius – (November 22– December 20) October is the last month with Jupiter in Scorpio – at least for another 12 years. With your ruling planet still wandering through that solar 12th house space, it’s time to count your blessings. Take stock of all those good things in your life – the things that you so often take for granted. Get some rest, because the pace is going to increase exponentially next month. Capricorn – (December 21 – January 18) You may feel a bit lonely this month with Vesta and Saturn joined in your sign. Vesta is also known as the goddess of the sacred flame, and her symbol looks like a solo candle – standing alone. She Lights your desire for spirituality, so, while the other signs are out playing, it’s your time for more serious activities. Contemplation and exploring the deeper meaning of life grant you the satisfaction you seek, Capricorn. Aquarius – (January 19 – February 17) You may find that people baffle you, and that you mystify others. The problem this month is that both Mars and the Dark Moon Lilith are visiting your sign. Lilith stirs up all kinds of antagonism, even if you didn’t do anything. People are looking for a place to hide their ‘stuff’, and some of them want to choose you. The best way to deal with Lilith is to take her head on – ‘not my problem’ is a powerful mantra. Pisces – (February 18 – March 19) Chiron slips back into your sign until March of 2019, and this may initially open up an old would. But know that it’s for full and permanent healing. Maintain your guard on the 26th when things get intense. Be honest, and you may even have to stand up for yourself! You have love coming your way, Pisces, something of splendor; you just have to know that you deserve it. This entry was posted in Uncategorized on September 28, 2018 by Andrea.